Peace on Earth and goodwill to men seems like a hard time for murder and robbery, but without murder and robbery, we wouldn't have a reason to enjoy Christmas Radio Detective Shows. Old time radio detective heroes would never let the bad guys get away, but, well, it is Christmas, so it should be no surprise when some of the bad guys wind up being, well, not really so bad, so it is understandable if they sometimes get away, in the spirit of the Season. Sherlock Holmes helps to rescue a Christmas Eve Party when Professor Moriarty plots to steal a rich family's presents, but Dr. Watson gives them to his house keeper's children. 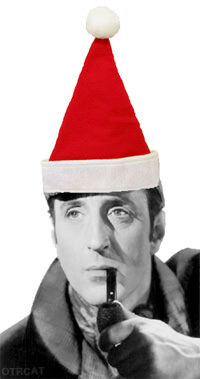 Simon Templar, played by Vincent Price on The Saint, spends Christmas Eve in a Santa Suit following a trail of bodies in "19 Santas". "The Man With the Action Packed Expense Account", Johnny Dollar, spends a Christmas investing the case of a prospector named Kris Kringle wants to leave his fortune to his burro in "The Carmen Kringle Matter". On Calling All Detectives, Jerry Browning finds six Santas at his Christmas party, all of whom have their pockets picked, but where is the mysterious Sixth Santa? And who is the Mysterious benefactor of the Veterans Hospital? Frank Sinatra as Rocky Fortune finds a job over the holidays as a department store detective and Santa's lunch-time replacement, then winds up involved in a Christmas jewelry heist. Archie Goodwin and Nero Wolfe become involved in a case where someone is slaughtering street-corner Santa Clauses, only to find out that one of the Santas is a millionaire. 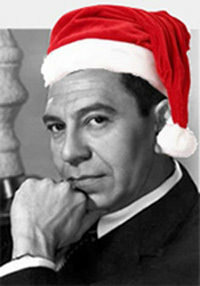 Hard-boiled but soft hearted cop Sgt Joe Friday of Dragnet always had a soft spot for the Christmas Season, and gave us one of the most uplifting and one of the depressing of Christmas stories. In "Rifle for Christmas" a cherished present is involved in a terrible Holiday accident, while "The Big Little Jesus" is a misunderstanding as much as a crime when the Baby Jesus from a Nativity display goes missing. Christmas is still a working day for newspaper people like Casey, Crime Photographer. On this Christmas Casey is assigned to cover a mysterious gentleman who hands out new dollar bills to the bums living on the street. Can this gesture really make a difference, or will the dollars just cross the bar at a local gin-joint? Be the first to comment on "Christmas Detectives"